OnLive, the fancy way of ‘streaming’ games to your computer or OnLive’s own set-top box, excels at allowing those of us without monster PCs or Mac Pros, to play all the latest titles without needing to splash the cash on expensive upgrades by streaming the video to a client machine, and sending key and mouse commands back in the other direction. It works well, for the most part. The service even has iPad and Android clients, but that’s not quite as exciting as you might think. See, the current releases of those apps don’t actually allow users to play any games, but rather offer an opportunity for the voyeuristic watching of other gamers as they traverse worlds, and kill zombies. It’s surprisingly engaging, but nobody could argue it’s as much fun as doing the work yourself. Soon though, we’ll be playing our games via our tablets, and there’s a handy-dandy controller on the way to help us do it. "We’re in the process of revving our controller, which will be coming out this Fall, to work with a low latency Bluetooth protocol so that it’ll work on the tablets," he said. "It’s the one thing that we thought that was missing; a console gaming experience on a tablet. You can play games like Deus Ex: Human Revolution with touch, which is sort of mind bending. But you realise that some of those games are great with touch, and some of them don’t do particular well." "This is going to blow people’s minds," he adds, tantalisingly. "Using a dual analogue stick to play high-end console games on a tablet. "As a gamer, it makes me happy that I can take my tablet and my controller, stick them in my bag, and take all my games with me. "We’ve done a lot of heavy lifting to get to this point right now. But the slogging part’s done, and now this is the fun part." If that doesn’t get you ever-so-slightly giddy at the prospect, it might be worth getting someone to check your pulse is, you know, still pulsing. Just imagine being able to play the latest PC and Mac games right on your iPad, with a real control pad in your hands. If that’s the kind of thing we’re going to get used to, we feel every so slightly sorry for the current crop of iOS games out there. How can they compete with Deus Ex and other big-budget titles? 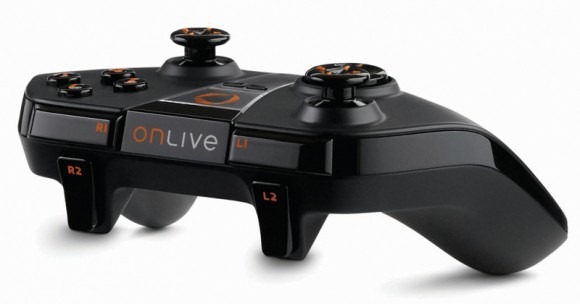 We’ll be watching OnLive very, very closely!